Help CentreUsing SuperControl Configuring my propertyHow do I add/edit my short break and weekly prices? How do I add my pricing? 2. To add prices click on the date your first price band should start within the Prices row. 3. In the pop-up window, enter your last date (this should be the day before your next price band starts). 4. Enter your weekly pricing and short break pricing, then Save. For instructions on how to enable when you allow your short breaks click here. 3. Then you can update your weekly price and short break pricing and Save. Repeat on your other price bands if necessary. Prev: How do I automatically schedule shorts breaks for late availability? Next: How do I enable short breaks? I have added my pricing, however in my website it is not showing 2018 pricing, what do I have to do to make 2018 visible on my website? if the short breks are set for say 5 days min does this mean it is applied all the dates it is set or only applied when you set apply 14 days before. if you have to apply it on a restricted time before the date you wish to get booked then it means the short breaks do not apply - it is off all other times. I probably need time to work that one out too. 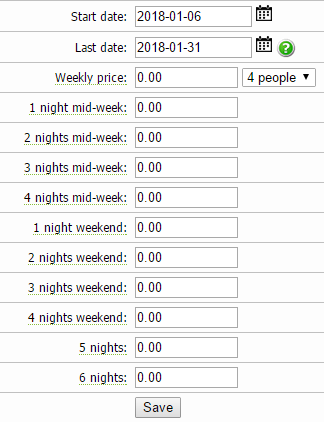 In your Price Planner if you have your minimum nights set to 5, this setting will only take effect during the periods you have your orange short break line enabled. If you have further details on your situation please contact support@supercontrol.co.uk and we can help diagnose any issues you may be having.